Winter is over and we're dreaming of greener pastures, whiter sands, bluer seas. It's time to start planning the summer family holiday! But we know it's hard to please everyone, so we've teamed up with Jet2holidays to plan your perfect family getaway to the Algarve. 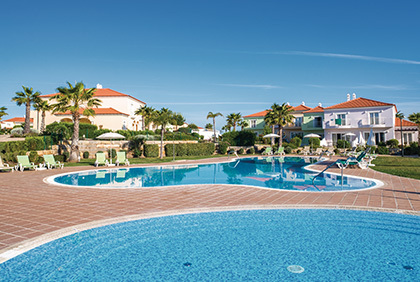 You could win return flights for you and your family, plus 7 nights' accommodation at the 4-star Eden Resort in Albufeira. Scroll down to discover everything the Algarve has to offer, from stunning beaches to delicious cuisine, then enter our competition for your chance to win. Boasting pastel-coloured villas and easy access to Albufeira Old Town and the local beach, using the complimentary shuttle bus. Relax by one of the 5 pools or enjoy a luxury treatment at the Adam & Eve Spa. Take your family away from it all with this piece of heaven on earth. We're taking you on a journey of discovery together with Jet2holidays. With Toby Anstis we've explored a different location each time, revealing the greatest beaches, the best places to eat, and the most fun things you can experience. Next up it's the Algarve! With scenic beaches, the Algarve offers the perfect mix of relaxation and culture. This is the place to head to for golden sand, year-round sunshine and perfectly manicured golf courses. Lying along the sparkling southern coastline of Portugal, you can even explore the open waters of the Atlantic here. Zoomarine - The underwater life-inspired theme park is just a few miles north of Albufeira. The park has a 4D cinema, aquarium, rides and places to eat. There are also pools and green areas for cooling down and relaxing. Alvor Boardwalk - Feel at one with nature and take a morning stroll on the Alvor boardwalk, taking in the gentle scenery, colourful flowers and wild birds. This wooden path stretches for miles and crosses the wetlands of the Ria de Alvor Nature Reserve, running alongside the beach, lagoons and estuaries. Ponta da Piedade - These beautiful coastal cliffs have been weathered over the centuries into rock pillars, caves, grottoes and sea arches. Set against the blue ocean, the effect is stunning. The best way to see it is on a boat trip to get up close and see the sun filter through the rock formations and bounce off the water. Slide & Splash Waterpark - If waterparks are your thing then the Slide and Splash in nearby Lagoa has it all. Brave the Kamikaze or the Black Hole, or race your friends on the Bonzai speed lanes. There’s an Olympic-sized pool if you want to relax and a fun kids' area with a water-spitting dragon and elephant slides. Go birdwatching on the Ria Formosa - Ria Formosa National Park is a vast maze of lagoons and tiny islands on the coast of Quinta do Lago. This epic ecosystem is protected by UNESCO and is home to loads of aquatic birds, such as flamingos, pelicans and storks. Walk along one of the nature trails or take a boat and glide through the lagoons. Dolphin Watching - Get a close-up of the show as local dolphins play and somersault from the waves on a dolphin safari from Portimão marina. Don't forget your camera! Albufeira Old Town bars - The bars in Albufeira’s Old Town are a relaxed alternative to its famous ‘strip’ in São João. Most of the bars are open until 4am in the summer and 2am in the winter, giving you plenty of time to get ready after a day at the beach. The main square is the hub of the old town’s nightlife and is great for families. Canico Restaurant - Take the lift through sheer rock to get to Canico, a restaurant built into the cliffs looking out onto a private cove. Come here for the Mediterranean menu and spectacular views and stay for the party. After hours, the beach transforms into an outdoor nightclub with a DJ and dancing on the sand. Dining out at Vilamoura Marina - Many of Vilamoura’s bars and restaurants are dotted around the marina and, whether you’re looking for a lazy lunch, sophisticated dinner or a casual drink, there’s a lot to choose from. Most places have outdoor seating and there’s a great atmosphere with lots of families and couples. Nights at NoSoloAgua - NoSoloAgua is a bar and restaurant in Portimão with panoramic views of Praia da Rocha’s beach. Its glamorous and exotic pool area is inspired by the Far East and its menu has lots of yummy meat and seafood dishes. DJs play music throughout the day and night, giving it a chilled Balearic vibe. Mimo Cooking School - Put your culinary skills to the test at Pine Cliff Hotel’s super swanky cooking school. From Traditional Portuguese Cooking to Michelin Star Secrets, pro chef Lucia has a tasty selection of step-by-step classes to choose from. And the wine tasting trivia nights offer even more mouth-watering experiences. Casa do Lago Restaurant - With beach hut décor and casual dress code, the Casa do Lago is a great place to unwind while you look out onto the Ria Formosa lakes. Its outdoor pool, pool bar and large deck area make it great for families to enjoy the day and there’s a tasty seafood and sushi menu all year round. Praia da Falésia - Falésia Beach stretches more than 6km between Vilamoura and Albufeira. The area closest to Vilamoura has beach clubs with cabanas and loungers for hire, which are great for groups. There’s plenty of room further down the sand for families, with friendly bars and restaurants to cool off in. Praia São Rafael - Years of erosion have blessed São Rafael with some interesting rock formations, which means it’s popular with tourists. The beach is wheelchair and buggy-accessible so ideal for families with small children. The stylish São Rafael Restaurante da Praia has panoramic views for diners and sells drinks and snacks to take away. Praia da Rocha Beach - A wide wooden boardwalk runs the length of Praia da Rocha beach and it’s sprinkled with restaurants, cafés and bars. As well as all the usual water sports the beach often hosts volleyball and beach football matches. Access is tricky with lots of steps but there’s beach-level access by the marina. Praia de Alvor - This Blue Flag beach is one of the most beautiful in the Algarve. A vast area of white sand, it's ideal if you want a sense of space and a back-to-nature vibe. It’s set a walk away from the village, by an estuary with sand dunes. Beginner surfers tackle the waves, while other folk have a go at water sports. Camilo Beach - A stunning beach surrounded by large rocky cliffs and grottoes that you can swim among, with large arches and coves to float under. At the top of the cliffs there's a small restaurant where you can eat fresh fish overlooking the sands. You can also take a boat tour to explore the many coves. Jet2holidays offers you package holidays you can trust. Their outstanding customer service has led to them receiving the Which? Travel Brand of the Year award, and all their holidays include your flights, hotels, transfers and In-Resort Customer Helper service. Not only that, but they're all ABTA and ATOL protected. Jet2holidays is all about the extras that make your holiday experience great: low deposits of £60 per person, free child places, 22kg baggage allowance, friendly flight times, and their free Resort Flight Check-In service.